Russian heavy-lift orbital launch vehicle. The N1M was found to be too ambitious. 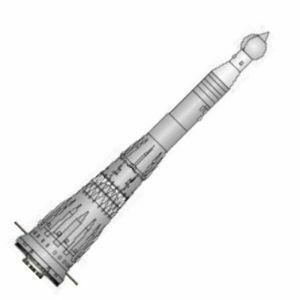 The N1F of 1968 was instead penciled in to be the first Soviet launch vehicle to use liquid oxygen/liquid hydrogen high energy cryogenic propellants. The N1F would have only used the Block S and Block R fourth and fifth stages in place of the N1's Block G and Block D.
Status: Development ended 1971. Thrust: 43,295.50 kN (9,733,216 lbf). Gross mass: 2,773,000 kg (6,113,000 lb). Height: 104.00 m (341.00 ft). Diameter: 10.00 m (32.00 ft). Stage 1. 1 x N1F Block A. Gross Mass: 2,070,000 kg (4,560,000 lb). Empty Mass: 126,230 kg (278,280 lb). Thrust (vac): 49,675.500 kN (11,167,497 lbf). Isp: 331 sec. Burn time: 125 sec. Isp(sl): 297 sec. Diameter: 10.00 m (32.00 ft). Span: 15.60 m (51.10 ft). Length: 30.00 m (98.00 ft). Propellants: Lox/Kerosene. No Engines: 30. Engine: NK-33. Status: In Production. Comments: Includes 14,000 kg for Stage 1-2 interstage. Stage 2. 1 x N1F Block B. Gross Mass: 620,000 kg (1,360,000 lb). Empty Mass: 55,700 kg (122,700 lb). Thrust (vac): 14,040.004 kN (3,156,318 lbf). Isp: 346 sec. Burn time: 120 sec. Diameter: 6.80 m (22.30 ft). Span: 9.80 m (32.10 ft). Length: 20.00 m (65.00 ft). Propellants: Lox/Kerosene. No Engines: 8. Engine: NK-43. Status: In Production. Comments: Includes 3,500 kg for Stage 2-3 interstage. Stage 3. 1 x N1F Block V. Gross Mass: 210,000 kg (460,000 lb). Empty Mass: 13,700 kg (30,200 lb). Thrust (vac): 1,608.000 kN (361,492 lbf). Isp: 353 sec. Burn time: 370 sec. Diameter: 4.80 m (15.70 ft). Span: 6.80 m (22.30 ft). Length: 12.00 m (39.00 ft). Propellants: Lox/Kerosene. No Engines: 4. Engine: NK-39. Status: In Production. Stage 4. 1 x N1 Block S. Gross Mass: 58,000 kg (127,000 lb). Empty Mass: 8,000 kg (17,600 lb). Thrust (vac): 392.000 kN (88,125 lbf). Isp: 440 sec. Burn time: 540 sec. Diameter: 6.70 m (21.90 ft). Span: 6.70 m (21.90 ft). Length: 16.00 m (52.00 ft). Propellants: Lox/LH2. No Engines: 1. Engine: RD-57. Status: Study 1967. Comments: Designed 1965-1971 as replacement for N-1 Blok G. Cancelled in 1971 in favor of development of single stage, Block Sr. Stage 5. 1 x N1 Block R. Gross Mass: 23,000 kg (50,000 lb). Empty Mass: 4,300 kg (9,400 lb). Thrust (vac): 73.500 kN (16,523 lbf). Isp: 440 sec. Burn time: 1,080 sec. Diameter: 4.10 m (13.40 ft). Span: 4.10 m (13.40 ft). Length: 8.70 m (28.50 ft). Propellants: Lox/LH2. No Engines: 1. Engine: RD-56. Status: Development 1976. Comments: Designed 1965-1971 as replacement for N-1 Blok D. Cancelled 1971 in favor of Blok Sr; revived and developed in 1974-1976. First static test Oct 12 1976. Two stages tested 1976-1977. Strangely never replaced Blok D on Proton. Family: heavy-lift, orbital launch vehicle. Country: Russia. Engines: RD-57, NK-39, NK-43, NK-33, RD-56. Spacecraft: L3M-1972. Stages: N1 Block R, N1 Block S, N1F Block A, N1F Block B, N1F Block V. Agency: Korolev bureau.